« Magic is Real. It’s Around You All the Time. This is an old and oft-repeated message, one that many hear, but do not understand. To many, it sounds weak and passive. It sounds like rolling over and being a doormat. Or it sounds holier-than-thou — something saints may do, but isn’t for ordinary folk. It may sound like a very nice thing to do, in some pollyanna-ish reality that does not exist. 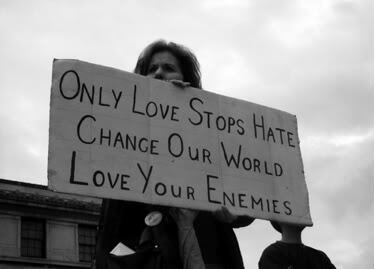 But in this world, love your enemies? Not happening. Hatred is an energetic trap. When you experience feelings of hatred around an “enemy,” you are actually locking and blocking your own energetic flow. You can see this when you look at people who get caught up in feuds. Think of stories of individuals caught up in situations where they seek vengeance. All stories about mobsters revolve around this. You can see that hatred breeds an endless cycle of violence and destruction. You do not have to be a member of the mafia to get caught in such traps. Ordinary people who sit around hating their bosses, or their exes, are also in a trap. They are blocking their own energy. These thoughts are like an energetic quagmire, a sinkhole, in which people can sometimes get stuck for their whole lives. That is why “loving your enemy” is not a nicey-nice thing. It is an act of tremendous power. It is a “get out of jail free” ticket. It is the key to the door of your prison. Loving your enemy does not mean “trust your enemy.” If you know someone to be untrustworthy, by no means trust them. It just means, can you see this person as a frail and flawed human. Can you see this person as the mess he is. It means, can you say a heartfelt prayer for this person. Again — it doesn’t mean trust them, or put up with abuse. It just means, seeing them as humans, not monsters. It means, asking a higher power to send light to this person, even if you cannot. If you do this, you are freeing up a great deal of stuck energy in your life. To learn to love your enemies is to liberate yourself. And there is nothing weak or passive about it. In fact, it is one of the strongest actions a person can take.